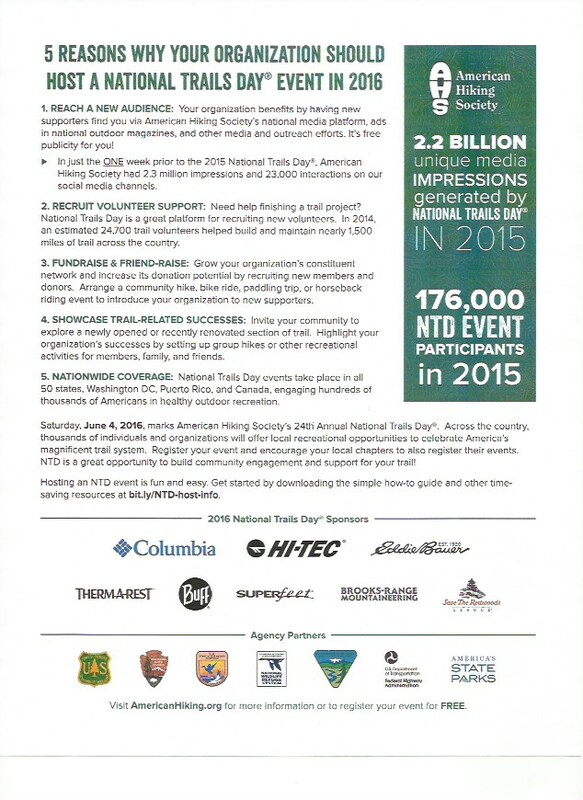 American Hiking Society’s National Trails Day® (NTD) is a celebration of America’s magnificent Trail System, occurring annually on the first Saturday in June. NTD features a series of outdoor activities, designed to promote and celebrate the importance of trails in the United States. Individuals, clubs and organizations from around the country host National Trails Day® events to share their love of trails with friends, family, and their communities. NTD introduces thousands of Americans to a wide array of trail activities: hiking, biking, paddling, horseback riding, trail running, and bird watching and more. For public and private land managers alike, National Trails Day® is a great time to showcase beautiful landscapes and special or threatened locales as thousands of people will be outside looking to participate in NTD events. National Trails Day® evolved during the late ‘80s and ‘90s from a popular ethos among trail advocates, outdoor industry leaders and political bodies who wanted to unlock the vast potential in America’s National Trails System, transforming it from a collection of local paths into a true network of interconnected trails and vested trail organizations. This collective mindset hatched the idea of a singular day where the greater trail community could band together behind the NTD moniker to show their pride and dedication to the National Trails System.